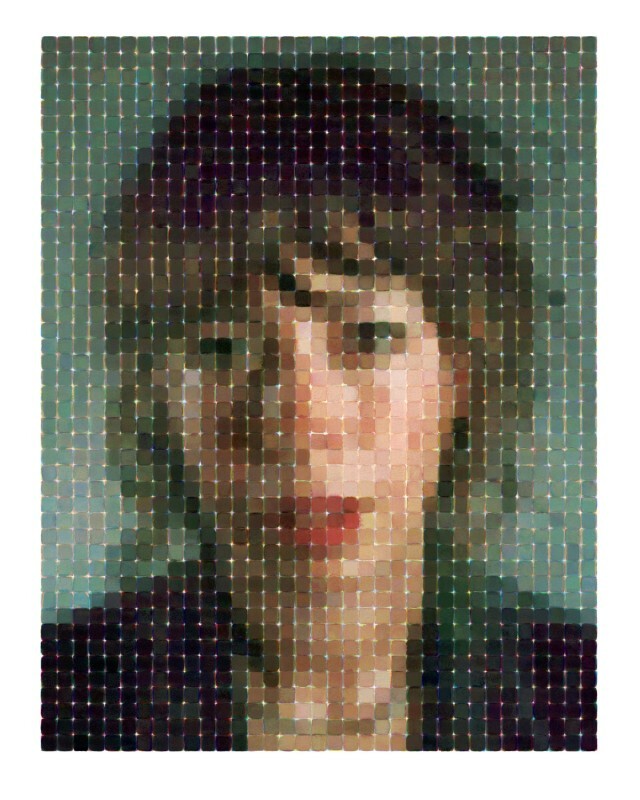 Chuck Close’s commitment to process finds him repeatedly circling back to revisit techniques and visual methods: in Close’s career, writes biographer Christopher Finch, cross fertilization has been the chosen method of propagation, with each technical approach informing every other. While his watercolor prints have direct antecedents in the systematic, color-separated watercolors Close began creating in the 1970s, the allover, continuous nature of these recent compositions blurs figure and ground and distorts pictorial legibility in a manner reminiscent of his particularly loose, abstracted oil portraits from the mid-1990s. Yet these prints have their own unique character, and are notable for arguably being Close’s first major body of digital work, excepting his tapestry editions. Contemporary digital imaging is recognizable by the relentless ferocity of its realism: with each technological advance, image files contain additional millions of pixels, and prints are created from tinier and tinier picoliters of ink, in turn yielding greater degrees of detail. As informed viewers, this level of detail clues us to the image’s composition. Even if the pixels are too small to see, we know that a mechanical process must have been involved in generating an image of such precise mimetic accuracy. In the case of Close’s airbrush portraits of the 1970s, the expected machine was a camera; in the present day, we trust that software and digital printers are responsible for the wealth of detail before us. Then and now, Close’s work delights in confounding our expectations. In Close’s watercolor prints, a uniquely digital precision is conflated with the gauzy abstraction and tactile values of watercolor – that plebeian, Sunday painter’s medium, an art-historical byword for Impressionistic lyricism. As the viewer’s eye relaxes focus, the subject’s face coalesces, rich with the color and tonality afforded by digital media; sharpening one’s gaze, the surface of the prints dominates: an array of tiny, sensuous color field paintings, each square reading individually as a wet blur or puddle of pigment. Close has embedded subtle shifts in materials [and] devices directly within the work, playfully disarming the received wisdom that poses an artificial distinction – whether historical or otherwise – between such seemingly disparate technologies as inkjet printing and watercolor. This embedded tension, a series of visual and perceptual frissons between surface and figuration, digital and analog, pixels and pigment, beaux-arts tradition and 21st-century trailblazing, makes no conclusive statement; it is instead the record of an open-ended inquiry, one currently engaging a great number of Close’s contemporaries. Writing about Christopher Wool in 2011, Mark Godfrey asks: How does an artist show painting’s involvement in technological networks of digital photography and printing – yet also engage the specific marks that only liquid materials can form when spilled and smeared, or when their pigments and binding mediums are allowed to separate? That Close is not the only one exploring this Moebius loop of digital and analog processes reveals his role within a larger discourse of image-making — a discourse that is as crucial to his process as the pigment and substrates with which he works.